Librarians know their library collections! We know just the right questions to ask for each library customer seeking their next favorite book. Library customer: Do you have any new penguin picture books? Librarian: Hi! Yes, we have a wonderful selection of them! Library customer: I’m looking for a new book with a penguin wearing a sweater. Librarian: Let’s walk over to the new picture book section and look under Animals. (Point out the new picture book stickers.) I saw the book you’re looking for yesterday. So many colorful sweaters! Books Found: Penguinaunt by Marcie Colleen, Little Penguin Stays Awake by Tadgh Bentley and Penguins Don’t Wear Sweaters! By Marikka Tamura. Librarians’ desks are usually covered in books! Books we’re reading, books for storytime, books for a library program but most of all books for sharing with library customers. One of my favorite parts of the day is readers’ advisory and finding the perfect book for a library customer. Librarians are experts at staying current – we’re up date on new books, we display them so they can be discovered and we find new genres. We review and read journals, websites, hashtags on social media platforms, newsletters from publishers and more. We attend conferences, literature festivals and other author events expanding our knowledge of new authors and illustrators. Ask yourself the following four questions and discuss with your library staff. How do you keep track of the books you read? Goodreads, Rifflebooks, Bibliocommons? 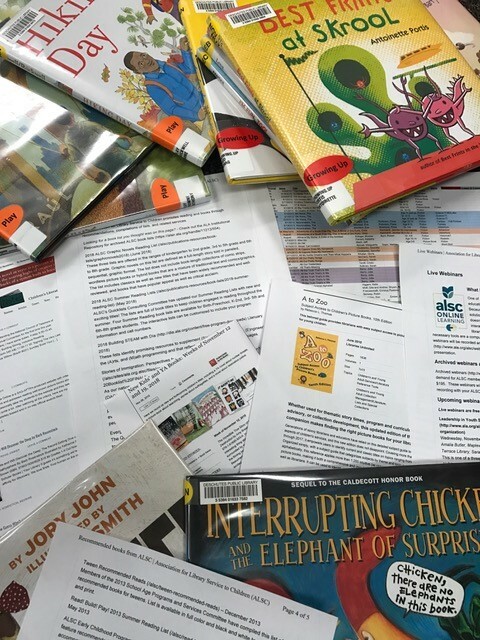 How do you prepare for readers’ advisory questions at the library? Explore new books lists on Pinterest, share new books at library staff meetings, circle favorites in library journals or publisher’s listservs? What does your library do now for readers’ advisory? MyReads? Library quick links? What are the challenges of readers’ advisory and how do you address them? We could talk about resources for days! Books! Blogs! Librarians on Instagram! New webinars! Explore what’s new at the ALA Book Store. An upcoming list of ALSC webinars plus archived webinars. Librarian Blogs: So many! Discover more on each librarian’s blog of recommended blogs. Review the updates books list on ALSC. Bookish: Articles, reviews and lists with the goal of providing more information about books, authors and genres. PLA provides a list of books and websites on readers’ advisory. Explore the Library Journal Book Pulse by Neal Wyatt: A daily updated designed to help collection development and reader’s advisory librarians navigate the never-ending wave of new books and book news. Novelist: Recommended Reads Lists, Browse Genres, Featured Read-alikes, Keeping Up and more. ALSC Notable Children’s Books: One of the best places to explore the best of the best from each year. My go-to list for teachers looking for new books and school librarians who have a limited budget. I always appreciate the time librarians take to create book lists, work on committees and share book information on ALSC Matters, blog posts and other social media platforms. Discover more ways to share new books and pair library customers with books they are going to love! This post addresses the following ALSC Core Competencies: II. Reference and User Services and IV. Knowledge, Curation, and Management of Materials.